Do you want a Halloween bud that really knows how to rock? How about one that'll make all your trick-or-treaters shriek with fear and joy? This guy is here to make all your dreary decor dreams come true! Post him by your side as you listen to spooky stories and decorate graveyard cupcakes for the October school bake sale. He can grimace with you as you wrap spiderwebs around banisters and door frames while trying to avoid thinking of post-Halloween cleanup. And when it's spooky showtime, simply pop three AAA batteries in and switch him on to take full advantage of his creepy persona! 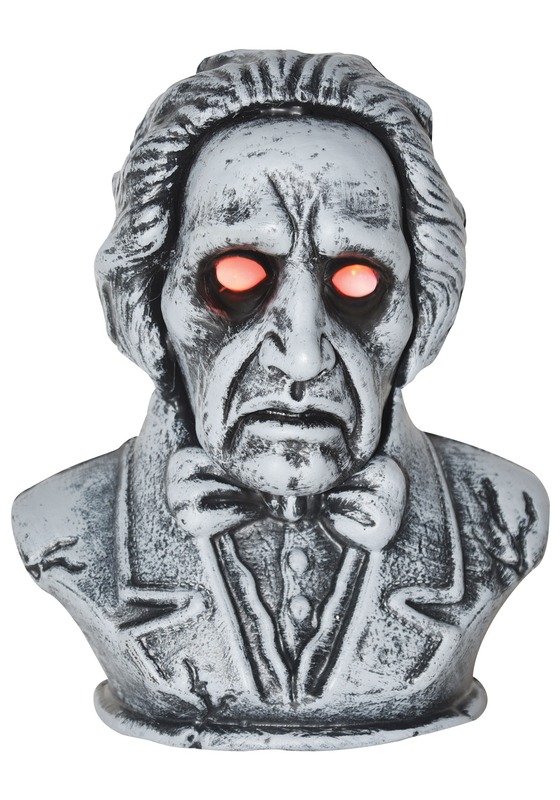 This lightweight bust looks like heavyweight Halloween decor from afar. The plastic is easy to move around but is finished to look like stone. The head is just over a foot tall and has eyes that glow red when turned on. Moving his mouth, this animated bust says creepy phrases such as Welcome and be afraid for delighting creeps to people who pass by. Want Halloween decorations that'll activate the imagination? This bust will look perfect with chandeliers, spider webs, and mood lighting. Check out the rest of our Halloween decorations and you're sure to find a perfect collection for your holiday celebrations!